Richard Emerson Ela — Ela Cider Co.
For the last two years, I worked on the Ela Orchard and lived in the house that my great-great-grandfather built upon first migrating to Wisconsin from New Hampshire in 1838. Richard Emerson Ela is one of our role models at the Ela Cider Company. The Ela’s had been in New England since not long after the Mayflower, and had nice vowelly biblical names like Israel Ela. 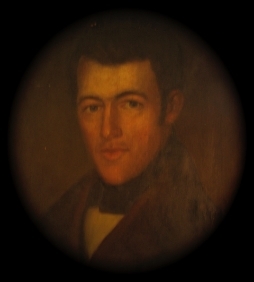 Richard Emerson, my great-great-grandfather, brought a more consonantal branch of the family to Wisconsin to find freedom from his father’s fanatical puritanism. He settled in Rochester and built a small workshop in which to build farming implements like fanning mills. The Wisconsin territorial census from 1842 records his name as Richard E. Ely. Our name confuses people to this day. Quickly he outgrew his workshop and built a factory across the river. With increased wealth from the business, he expanded the house, adding on rooms and a second story. The styling of each room tells its story – the first rooms to be built are small and cramped, the later ones lofty and ostentatious. At some point, Richard Emerson abandoned the business. No one quite knows what happened. Perhaps competition with other fellows like J.I. Case and John Deere got too intense and drove him out of business. Perhaps he had an aristocratic ideal that owning land was more prestigious than factory work. My own belief, after living in his house for two years and experiencing life on a farm, is that he found liberty in the land. He found freedom from the constant grind of business. He turned to the earth and away from possible fame and fortune. What I’ve come to appreciate most about this ancestor of mine is that he consistently lived out his values. His profile is of a man who was willing to risk anything to pursue his beliefs. He chased a dream of freedom to Wisconsin, helped others chase the same dream along the Underground Railroad, and set the stage for his descendants to find the freedom of their own choosing. We, his descendants at the Ela Cider Co., appreciate his example and hope we can live as strongly as he did.